At a symposium on hate speech held this evening in New Delhi, under the auspices of the Centre for Communication Governance at National Law University, Delhi, sharp differences among two key speakers came to the fore, on whether the Supreme Court missed an opportunity to issue suitable directions to contain hate speech in Pravasi Bhalai Sangathan v Union of India, delivered by a three-Judge bench in March 2014. In this case, the petitioner, an NGO dedicated to the welfare of inter-state migrants, sought directions to declare hate/derogatory speeches made by political and religious leaders on religion, caste, region and ethnic lines as violative of various Constitutional provisions guaranteeing fundamental rights, and ensure speedy prosecution of those allegedly making such speeches. The Supreme Court’s three judge bench, justices Dr.B.S.Chauhan, M.Y.Eqbal and A.K.Sikri, declined the plea because the directions sought for “incapable of enforcement/execution”. However, it requested the Law Commission to define the expression, “hate speech” and make recommendations to Parliament to strengthen the Election Commission to curb the menace of “hate speeches”. 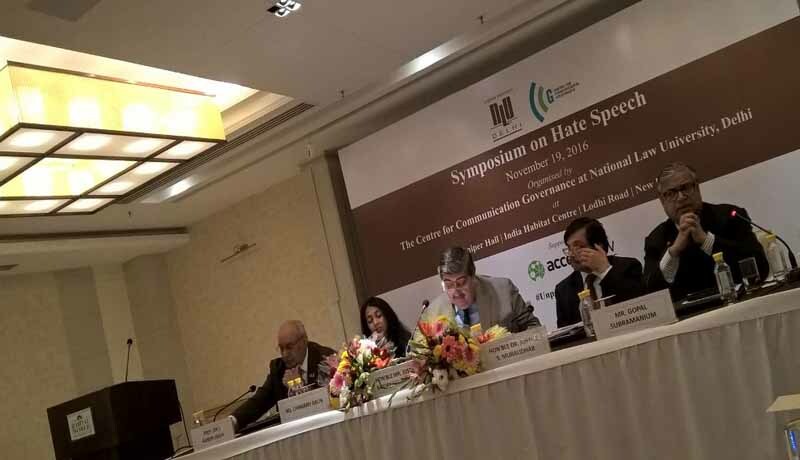 At the Symposium, Senior Advocate, and former Solicitor General, Gopal Subramanium, blamed the bench for its failure, saying that “it had missed a fantastic opportunity” on the specious plea that issuing directions to control hate speech, would have meant judicial overreach. Subramanium referred to Paragraph 10 of the judgment, which lists nine enactments with corresponding provisions dealing with control of hate speeches, and said implementation of these Acts is so lax that instead of confronting the problem, the bench referred it to the Law Commission. The author of the judgment is now the Chairman of the Law Commission, Subramanium quipped in passing. Gopal Subramanium defined hate speech as the best form of manipulation, and said it is like wild fire, and in fact, spreads faster than fire. Lawyers are not forthcoming to protect the victims of hate speech, because, he said, of the lawyers’ asking why should they protect their rights. “This is not the right, which Subramanium Swamy, had invoked in his petition against criminalizing defamation”, he said. Gopal Subramanium cited the experience of South Africa, to understand the issue better. South Africa, which had paid enormous price for divisions, had found it necessary to impose reasonable restrictions on hate speech, he said. The Madras High court chief justice, Sanjay Kishan Kaul, in his inaugural address, said social norms keep changing, and we are not able to tolerate another viewpoint easily. “Tolerance levels are going down”, he lamented, and added that the State has a role in protecting freedom of expression. Asking the question , to what extent judiciary can accept criticism, he said it is practically impossible to give a set of examples. Justice S.Muralidhar of the Delhi High Court, in his Distinguished Address, said unpopular opinions, disagreements, and criticism are not hate speeches. He regretted that the misuse of Section 124A IPC, dealing with sedition, is alarming. “By the time, it gets corrected, it is quite a process”, he said. Speaking on the hate speech on the internet, he asked the audience to understand the nature of the beast. If someone merely likes an opinion, by clicking ‘Like’, he or she takes the risk of having a policeman knocking at his or her door. “A close watch is being kept on individuals using the net”, he cautioned. On the other hand, one can spread hatred through anonymity, and protect oneself from retribution, while subjecting others to vulnerability. “It is not possible to prevent hate speech, but can only expect compliance with take down orders, after the damage is done”, he explained. Referring to the phenomenon of State itself filing complaints, he asked whether people who have to decide the threshold can lose objectivity. Justice Muralidhar regretted that truly democratic space is missing on the internet. Pointing out that opinion is virtually “constructed”, he said there are special cells in political parties which capture space on the internet. “There is lot of information, but very little knowledge”, he quipped. He deplored that the investigators in the cyber crime cells lack training , and there are no devices to gather evidence, while the courts are not equipped. Justice Muralidhar emphasized the need to anonymise parties’ names in the court’s records, most of which are online, and they remain online for ever, violating the parties’ right to privacy, even after the litigation is over. Others who participated in the Symposium include senior advocate of Supreme Court, Anup Bhambhani, Global Policy and Legal Couinsel, Access Now, Peter Micek, Journalist, Rishi Majumder, and Executive Director, CCG, Chinmayi Arun. Prof. Ranbir Singh, Vice Chancellor, NLU, gave the Welcome Address, while Professor G.S.Bajpai, Registrar, NLU, gave vote of thanks.